An aperitif is a refreshing drink that is served before a meal to stimulate the appetite. Aperitif cocktail recipes typically include gin, vermouth or an aperitif spirit such as Campari. The list of drinks that qualify has many of the oldest and most popular cocktails. Many of the fancy martinis that include vermouth are also considered to be aperitifs. Aperitifs are, essentially, "before dinner drinks". They may be served to mingling guests before a dinner party, during a course of appetizers or while preparing your own dinner on an average night after work. Think of the aperitif as a liquid appetizer. "Apéritif" is a French word and its Italian counterpart is "aperitivo". The opposite of an aperitif is a digestif, which is typically served at the end of a meal (it is a fancy word for a dessert cocktail). The aperitif cocktail works because of two common characteristics. Sugar tends to limit the amount of non-sugary foods that we want to eat and that is why aperitifs have a drier, more bitter flavor profile. Our appetites are also diminished if we have too much alcohol in our system and that is why the aperitif is often low-proof. Anyone who has either consumed a super sweet soda before dinner or gone on a binge with their drinking will recognize what sugar and alcohol can do to the appetite. The aperitif style is meant to combat those two factors and help us eat a healthy amount of good food. There are many cocktails that make great aperitifs and a full list can be found in The Aperitif Cocktail Collection. 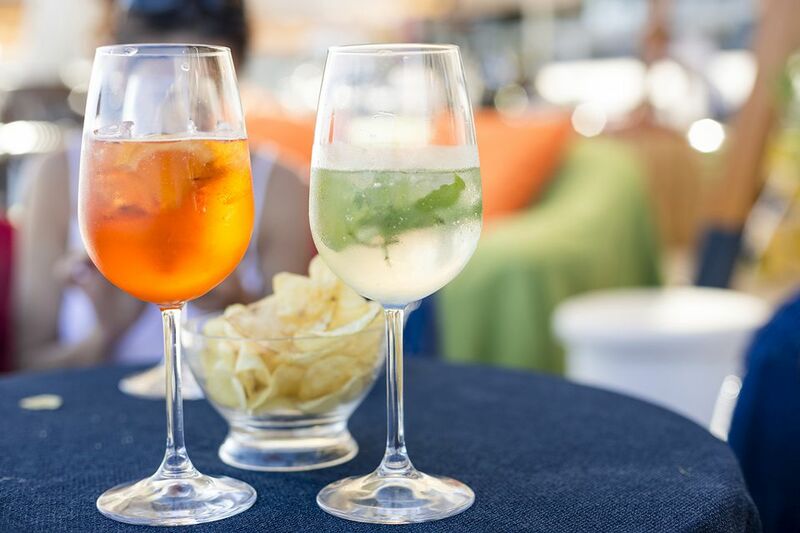 Here are just a few examples to demonstrate both the range and characteristics of aperitifs. The word aperitif also refers to a class of alcoholic beverages that are designed to stimulate appetites on their own. It is a very broad category that includes a great variety of styles. The only common ground is that they typically involve herbs or other ingredients that aid in the stomach's digestion of food. Many of these have a bitter or herbal profile and many (e.g. Campari and Aperol) are proprietary recipes held under a single brand name. Aperitifs are an age-old tradition and have been produced for centuries. Even some of the popular brands have a signature recipe that has been used for a century or more. Some aperitifs are distilled and more of a liquor while others, like vermouth, are a modified version of wine. If a cocktail includes one of these aperitifs, one can be assured that it is likely to make a great aperitif cocktail. Many of these aperitifs can also be served on their own or as a taller drink with a little soda or tonic. Great examples of these drinks are the Aperol Spritz and Campari & Soda.